Would you pay $10 to prevent a ton of topsoil from being eroded into our waterways? Tractors, combines, semis and grain carts are running full force across Holmes County as farmers work to harvest this year’s crop. But as those crops are coming off the fields, have you noticed a new crop being planted? If you keep your eye on the farm fields as you drive across Holmes County, you will see a new, green crop growing in many fields after the corn and soybeans have been harvested. That green growth is what we call a cover crop, and instead of a grain commodity, it’s producing conservation credits. No, conservation credits and improved soil health cannot be taken to your local cooperative or grain elevator to be marketed and sold like traditional commodities of corn and soybeans, but they certainly have value – not only to the farmer who invested his or her resources into growing a conservation-minded crop, but also to those of us who live in Holmes County and share the same watershed and ecosystem with that farm. That’s why Holmes Soil & Water Conservation District is partnering with the Muskingum River Watershed Joint Board in implementing the Credits 4 Conservation program. Credits 4 Conservation allows local community members and businesses to partner with local farmers to purchase that conservation crop our producers are growing by implementing practices like cover crops. Each credit is just $10 but is a quantified, verified pollution reduction to our watershed. Basically, every conservation credit purchased guarantees that one ton of topsoil, 1 pound of phosphorus, and 1 pound of nitrogen has been prevented from eroding into our waterways. Does that cover the entire cost for our farmers to implement the conservation practices that protect those soil and water resources? No, but it’s at least a start in placing a value on how those conservation practices help our community and our ecosystem as a whole. What purchasing credits does, however, is allow the community members and businesses of Holmes County to show their support by standing shoulder to shoulder with our local farmers with the message that conservation matters to Holmes County – and it allows you to help financially support the implementation of future conservation practices. Just like farmers use the proceeds from the sale of this year’s crop to finance the crop they will plant next year, these conservation credits currently offered for sale are from conservation programs that have been completed and yielded a specific conservation improvement, and the proceeds from the sale of these credits will be reinvested into a new crop of conservation practices next year. Last year alone, 33 Holmes County farmers participated in the Credits for Conservation program, growing over 3,000 acres of cover crops in Holmes County. What does that mean to you? It means well over 16,000 tons of soil were prevented from eroding into our waterways, along with over 15,000 pounds of phosphorus and 30,000 pounds of nitrogen. But why does that matter to you? It takes 500 years to replace just one inch of topsoil, and that topsoil is vital for our nation’s food supply. That means it’s vital for our topsoil to stay in place instead of being lost to erosion. Likewise, phosphorus runoff into waterways can create problems as well, like the algae blooms present in Lake Erie and the hypoxic dead zone in the Gulf of Mexico. And not only does nitrogen runoff feed nuisance plant and algae growth in our waterways, but ammonia can also be toxic to fish. So would you pay $10 to prevent a ton of soil from being eroded into our waterways? 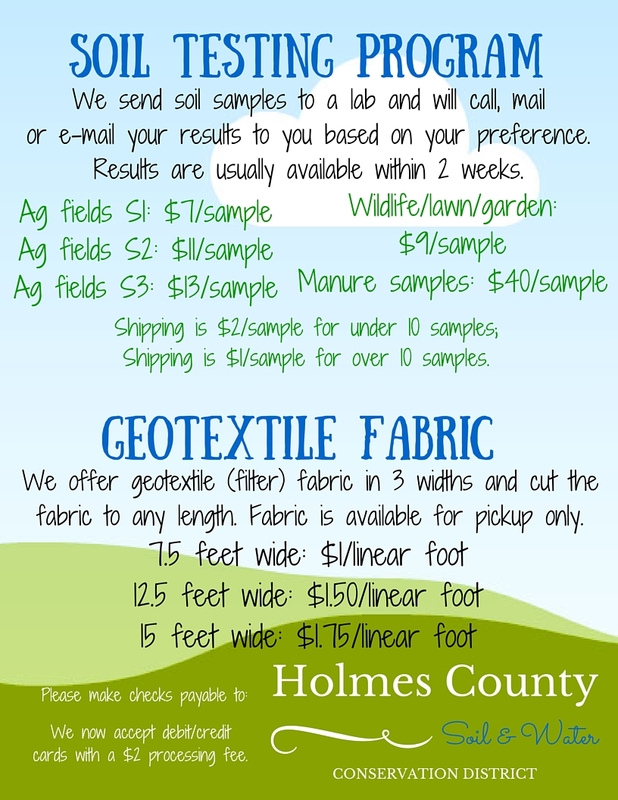 If so, purchasing conservation credits is a great way to support local, on-the-ground conservation in Holmes County. Purchases can range from just $100 to $5,000 or more; every little bit helps. For more information, visit credits4conservation.com or call me at Holmes SWCD at 330-674-2811 to learn more about how you can partner with our local farmers to improve the health and vitality of our watershed and ecosystem. Newer PostThe season is just around the corner. Are you ready? Older PostWhat is a Paw Paw?